US Secretary of State Rex Tillerson has said the US wants to deepen co-operation with India in the face of growing Chinese influence in Asia. He described India as a "partner" in a "strategic relationship", adding the US would "never have the same relationship with China, a non-democratic society". He said Beijing sometimes acted outside international conventions, citing the South China Sea dispute as an example. His comments come ahead of his visit to India next week. Meanwhile, President Donald Trump will visit a number of Asian countries including China, in November. Speaking at the Center for Strategic and International Studies think tank in Washington, Mr Tillerson said "the United States seeks constructive relations with China, but we will not shrink from China's challenges to the rules-based order and where China subverts the sovereignty of neighbouring countries and disadvantages the US and our friends". He also described the US and India as "increasingly global partners" who "don't just share an affinity for democracy. We share a vision of the future." The secretary of state's remarks came hours after Chinese President Xi Jinping's speech at the Chinese Communist Party congress, where Mr Xi signalled that Beijing intended to play a greater role in world affairs. Mr Xi said that China had now "become a great power in the world", and that the Chinese growth under Communist rule had given "a new choice" to other developing countries. 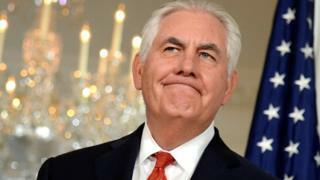 However, in his speech on Wednesday, Mr Tillerson criticised "China's provocative actions in the South China Sea", saying they directly challenged "the international law and norms that the United States and India both stand for". "China, while rising alongside India, has done so less responsibly, at times undermining the international, rules-based order," he added. He called on India to play a greater security role in the region, saying "India and the United States should be in the business of equipping other countries to defend their sovereignty... and have a louder voice in a regional architecture that promotes their interests and develops their economies." Following Mr Tillerson's speech, the Chinese Embassy in Washington said in a statement that Beijing "will never seek hegemony or engage in expansion, never pursue development at the expenses of others' interests". It added that China "contributes to and defends the rules-based world order".